Now, who's going to be playing? Here's hoping the weather will be as good as this. 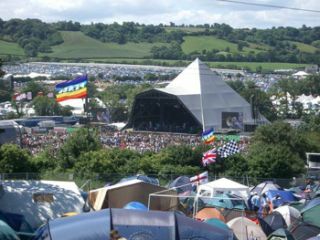 The UK might currently be suffering its severest winter weather for some years, but that hasn't stopped music fans from snapping up the last remaining tickets for the 2009 Glastonbury Festival. Organisers have confirmed that the event is now sold out. An early sale of tickets began in October 2008, and the "vast majority" of those who paid a deposit are said to have made their full payment by the 1 February deadline. In a message on the festival's website, co-organiser Emily Eavis said: "Thanks to everyone for keeping the faith; it's certainly shaping up to be another vintage year for Glastonbury Festival, with a brilliant line up to be unveiled in June." Who will be part of that line-up will now be the subject of much debate. Names such as Radiohead, Blur, Bruce Springsteen, Coldplay and even Led Zeppelin have been mooted, but as yet, no headliners have been confirmed. A very limited number of cancelled tickets will go on sale on 5 April.